Many businesses aren’t sure if influencer marketing is a fit for them, or even how to go about pursuing a relationship with potential influencers. In this article, you’ll discover why social influencer marketing is useful, where brands are running influencer campaigns, and which tactics are most successful. 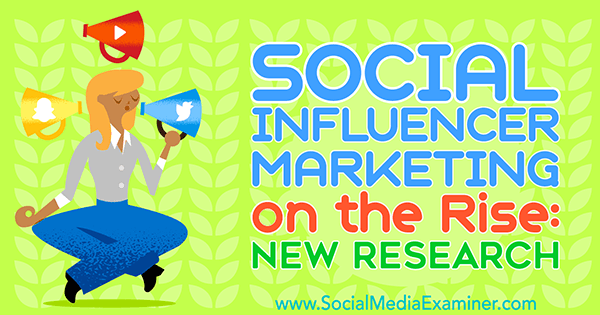 Social Influencer Marketing on the Rise: New Research by Michelle Krasniak on Social Media Examiner. According to the 2016 Influencer Marketing Report released by Chute (a user-generated content marketing solution), 66% of the more than 200 marketing professionals surveyed used social influencers as part of their marketing strategies in 2016. Of these, 80% report doing so because they want to reach different audiences on social networks and 70% want to reach smaller niche audiences that brands sometimes have trouble identifying and connecting with. Looking ahead, 40% of respondents not currently using social influencers plan on implementing a strategy in 2017. 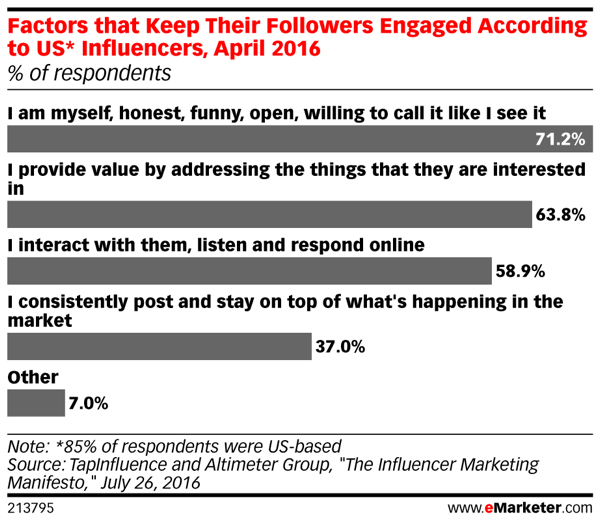 Reaching new audiences isn’t the only reason social media marketers are turning to influencers for help, however. In their February 2016 report, Influencer Marketing for U.S. Brands: The Platforms to Watch, and the Best Ways to Work with Creators, eMarketer found that one of the top reasons companies use social influencers is rising concerns about ad blocking and ad avoidance. This fact is bolstered by Omnicom Media Group‘s July 2016 study that showed 69.8 million Americans will use ad blockers in 2016, a rise of 34.4% from 2015. This is where social influencers come into play. With authenticity being such an important part of a company’s brand image on social media, marketing departments are turning to trusted online personas to get their products and messages out to the consumer. After all, are you more likely to pay attention to a message from a real person, or a pop-up or pre-roll ad that keeps you from consuming the content you want? 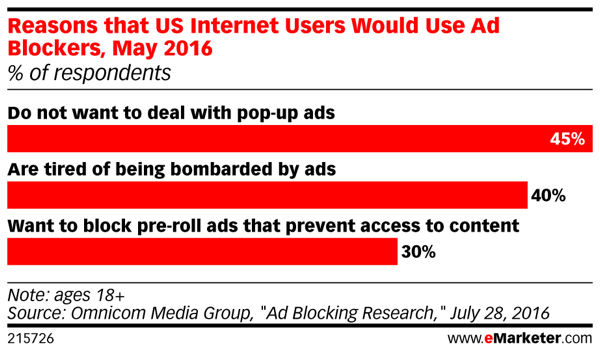 Consumers are pushing back against invasive Internet advertising. Celebrities are often the first people thought of when discussing social influence; however, virtually anyone with a unique shtick can amass a large, loyal following that gives them social media influencer status. Marketers are having to get more creative for their messages to be seen by consumers. In today’s crowded social network ad environment, that’s easier said than done. With the rise of programmatic buying, the competition for ad space is heating up and, depending on your industry, getting more expensive. Using social influencers is a great way for companies to differentiate themselves. The influencers come with built-in audiences that marketers can tap into, saving some time and money typically spent on market research and audience targeting. The flipside of that coin, however, is that one of the biggest hurdles social media marketers report is identifying influencers to work with. While brands often manually search for potential influencers to work with, doing so is a time-consuming process and doesn’t guarantee a good match. Often one of the first factors companies look for when finding social influencers is how large their audience is. However, the February 2016 eMarketer.com survey found that an influencer’s engagement numbers are a better indicator of success than the size of his or her audience; specifically total reach, audience demographics, views and/or impressions, click-throughs, and the number of likes and comments on social media posts. 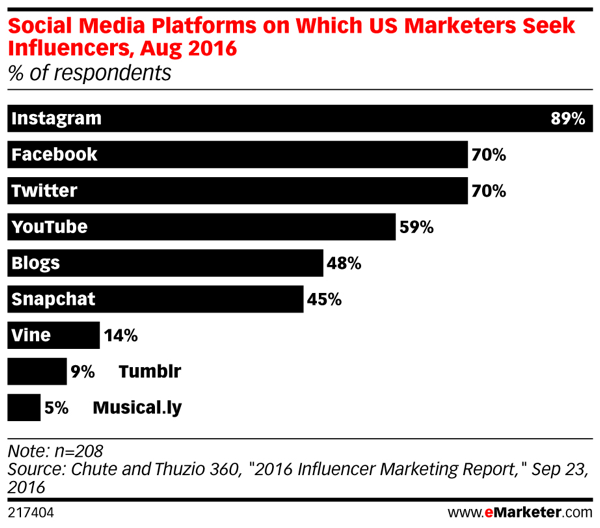 Instagram leads the pack when it comes to social influencer marketing. Having said that, engagement numbers depend on the social network being used. The Chute study found that the overwhelming majority of marketers who use social influence marketing do so on Instagram (89%), while Facebook and Twitter were tied for second with 70% each. It’s not just how or how much an influencer engages with his or her audience, it’s also a question of why the audience engages with the influencer. The Influencer Marketing Manifesto, written by TapInfluence and Altimeter Group in July 2016, showed that out of the 1,753 influencers surveyed, 71.2% say their follows remain engaged due to the influencer’s authenticity. 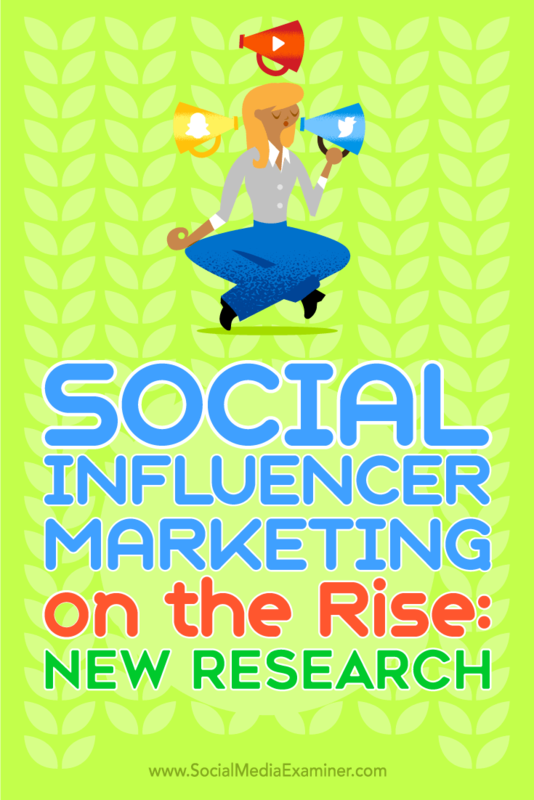 Interestingly, only 58.9% of respondents reported that their followers were engaged because the influencer interacted, listened, and responded online. This is a slight shift away from the emphasis that brands put on the importance of interacting directly with consumers online. Why social influencers are effective. The same study by TapInfluence and Altimeter Group also found that using social influencers for ongoing ambassadorships is the most effective marketing tactic, according to nearly 71% of the 102 marketers surveyed. Product reviews came in second with 66.7% of the respondents finding them worthwhile. Brand mentions (53.9%), event coverage (52.9%), and sponsored content (50%) came in third, fourth, and fifth, respectively. These results lend credence to the idea that consumers look for and appreciate authenticity when it comes to influencers. If a person continues to use a product, one could assume that said product is a good one and worth checking out. When a product is reviewed, there’s always a slight chance that the reviewer may not be entirely honest about his or her opinion to keep the brand happy and willing to continue the relationship. It’s a simple fact that while most companies say they want honest reviews, if an honest review doesn’t paint the brand in a positive light, it could hurt business. While the assumption is that social influencers are being authentic, there’s always a possibility (regardless of how slight) that their opinions are swayed by the desire to continue the business relationship. 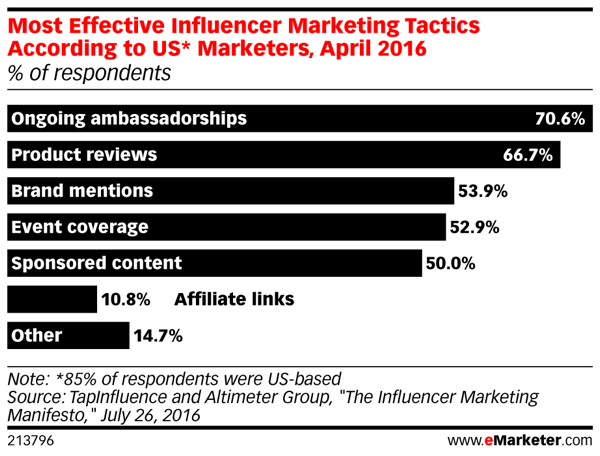 Ongoing ambassadorships show a level of dedication on the part of the influencer. There’s more to incorporating influencer marketing into a strategy than selecting a well-known individual to interact with your brand in some way on social media. If your social influencer does not have a strong, loyal following on the social network where your target audience is found, your strategy won’t be as successful as it could be. Although it’s been around for a few years and is gaining popularity, many marketers still shy away from using influencer marketing because they simply don’t know where to start. In fact, 75% of respondents in the Chute study stated they haven’t implemented social influencers in their social media marketing because they don’t know how to start such a program. This includes not knowing where or how to find the right influencers for their brand. A number of firms have cropped up to act as “matchmakers” between brands and social influencers. Using one of these services could be a great way to get a foot in the door and learn what goes into finding the influencers who will benefit your brand the most. Measuring the success of social media marketing campaigns has always been a challenge for marketers. New tools and methods have surfaced that take some of the guesswork out of it and onboarding decision-makers has gotten easier now that the usefulness of social media has been demonstrated; however, the need to definitively measure ROI has not gone away. It’s no different with social influencer marketing. There’s room for improvement when it comes to influencer marketing. 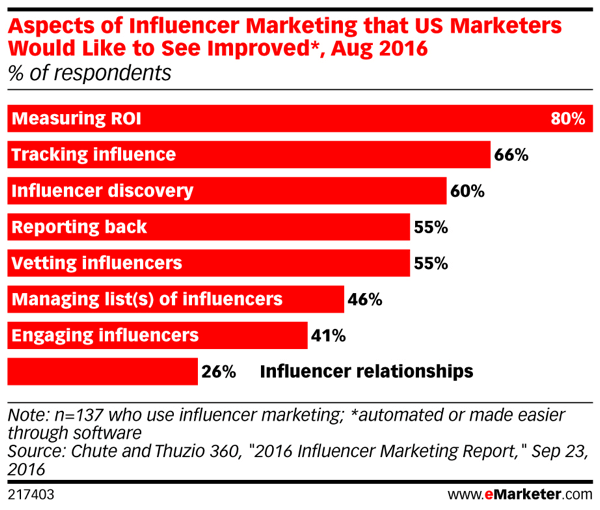 In fact, 80% of the marketers surveyed for the August 2016 Chute and Thuzio 360 study said that measuring ROI is an aspect of influencer marketing that needs improvement. Sixty-six percent say they wish they had better options for tracking influence and 60% wish it was easier to discover influencers. With social influencer marketing, you’re not solely dealing with the behavior of your social media team manning the accounts. You now have a third-party representing your brand on social media and the results of this relationship can be harder to predict and control. There’s also the fact that you’re dealing with an individual who is a brand in his or her own right; one who is used to having creative control over what he or she posts. Crowdtap‘s November 2015 study, The State of Influencer Marketing, found that 77% of the 59 social influencers surveyed stated that they’re most likely to work with brands that grant them creative freedom over what they post. This lack of control can put marketers at a significant disadvantage when attempting to measure ROI and make any necessary strategy adjustments to improve it. Creative freedom is a must-have for social influencers. If a brand wants (or needs) to have strict control over the activities that are heavily counted when calculating the ROI of their social influencer marketing campaign, it’s important to know how much creative freedom the influencer wants. They also have a reputation to uphold, and not being able to control the types of content they post can be detrimental (or even fatal) to the business relationship. If this happens, a brand is more likely to have difficulty finding influencers willing to work with them in the future. The insights above show why social influencer marketing is useful, where it best fits into your overall marketing strategy, and the importance of setting expectations for such a business partnership. Social influence marketing is using influential people on social media networks to help brands build relationships with new and different audiences. What do you think? 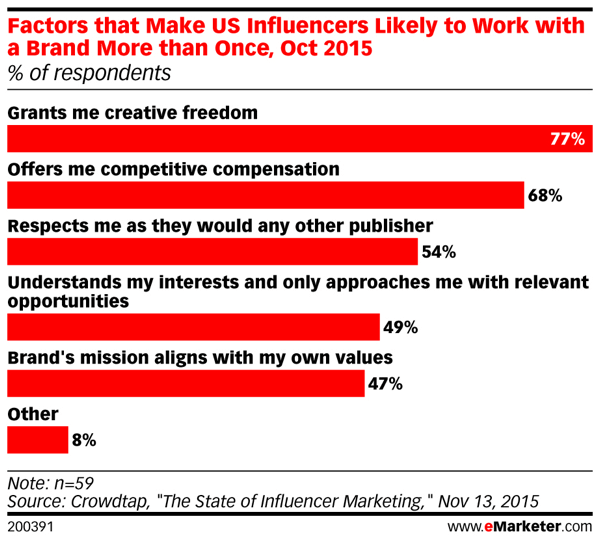 Are you more inclined to pursue influencer marketing? Share your thoughts in the comments below.